We have a closet chocked full of board games for children. Over our homeschool years, we have accumulated more indoor games for kids than I care to admit! You will find some of our favorites on the educational kids page. We are more fond of some than others, but for the most part all of them are fun. Make some wonderful family memories with any one of our favorites below. Battleship - Do you have what it takes to command your own fleet of ships? This classic naval combat game is one you most likely played as a kid. As you try to find your enemies hidden fleet while keeping your own ships' positions top secret! The thrill is in hearing your opponent cry "Hit!" Cranium - Comes with four sets of instruction cards and a container of sculpting clay. You have to answer questions, draw or sculpt, hum or perform, or spell words (backwards!). It is one of our family favorites as four or more people can play. 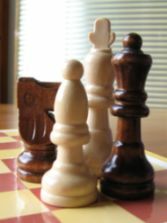 Checkers/Chess - You’ve no doubt played these, but just in case, I didn’t want you to leave them out. Dad and Garrett usually play these great strategy board games for children. Family Feud Board Game - “100 people surveyed…top three answers on the board...name something…” Remember Richard Dawson? This box game is very much like the game show and under ten dollars. Click here to see what the “Survey Says!" 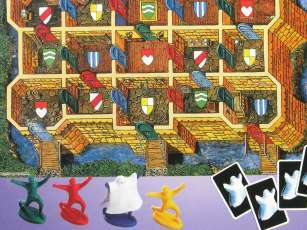 MacGregor - Another Ravensburger favorite (pictured below). Everyone tries to stay out of the path of the ghost. Hopefully you’ll make your way out of the castle without being caught. MasterMind - According to the box, it’s a challenging game of logic and deduction. I would have to agree. Mark and I used to play this before we were even married! Pathfinder - A two player tracking game of strategy and imagination. Hide your pawn and secretly construct a winding path leading to it. Hopefully you’ll find your opponent’s secret pawn before he/she finds yours! Pictionary - This game is played like charades, only on paper. Your teammates try to guess certain words that you attempt to sketch. When we don’t use the board, it’s one of my favorite games! Each person in the group gets their turn to draw, while everyone else tries to be the first one to guess. If you guessed right, you get a point. The one with the most points wins. Try it sometime! Stratego - Another two person strategy game. The object of the game is to capture the opponent’s flag. This is another of those board games for kids that has been around for a long time. 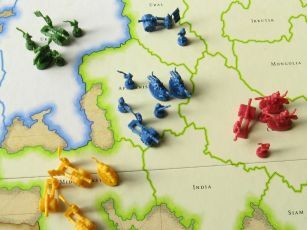 Risk - Lead your armies across continents to launch attacks against your enemies. The box says it has led the world in military strategy games since 1959. Wow! Start this game early - maybe right after lunch. It takes a l-o-n-g time to play! We trust your family will have a great time playing these board games for children.